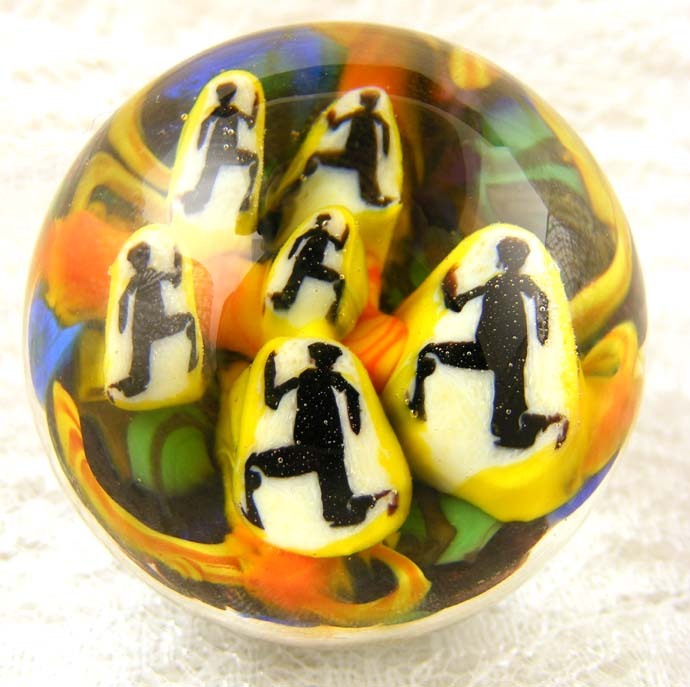 This is one of the marbles I have made with my running man murrini. Just a thought; where will we go if this world comes to an end. On the other side the earth is exploding. This one sold before I had a chance to list it. I posted it in my bead artists gallery, and it was featured in a few moments. TOOT TOOT! Reality- They say the ice bergs will be melted by 2050. Reality-the rain forest will be sand in 2100. I am concerned for my children and grandchildren. While this lye’s in the back of my head, I can not help but to make some art about that. Art is great at creating awareness about what is going on in the world today. Another project I am involved with is giving my scrap glass to a Artist furniture designer friend,Paul Hickman. He uses recycled materials to create his work. That is another great idea, that is art that is actually making a difference in the world. (Less landfill, and it encourages others to do the same.) I will share some pictures shortly. Go check out his work. And! His son (under 10 years old) is very creative as well, he has been collaborating with his Dad to create art prints. I am inspired! Torchin’ Tuesday is looking like a whole new day! Almost forgot to tell you..
Click here for my new article at WMC; I talk about my Grandma Sally! What is it? WMC? Watch me create? A team blog about inspiration and art.